Let the summer activities commence! If you live in South Florida specifically, there’s a decent chance that you own a jet ski. There’s no question that zipping around on the water can be a ton of fun for you and the family. With that said, it can also be incredibly dangerous if you’re being careless. In this blog post, we will take a look at some of the precautions and safety measures with jet skiing. Wear a lifejacket – Your summer could very well include a mix of jet skiing and boating. It’s imperative to wear a lifejacket in either case. Keep in mind that a lifejacket doesn’t serve its purpose if it doesn’t fit the way it should. For example, one that’s too big can cause water to push the jacket up toward your face, making it more difficult to float in the water. Jackets that are too small, on the other hand, can make it just as challenging to stay afloat. These precautions should be magnified when children will be on the jet ski. A properly fitting lifejacket will significantly reduce the chance of injuries and drowning. If you’ve been using an older lifejacket for some time, it’s a good idea to check that’s approved by the U.S. Coast Guard and that it’s sufficient for jet skiing. Wear a watercraft helmet – Those under the age of 18 should wear a watercraft helmet in order to prevent head injuries if ejected from the jet ski. Plus, a helmet can protect against flying debris should you hit something in the water. While most states, don’t require helmets while jet skiing, it’s strongly recommended while your personal watercraft is in motion. 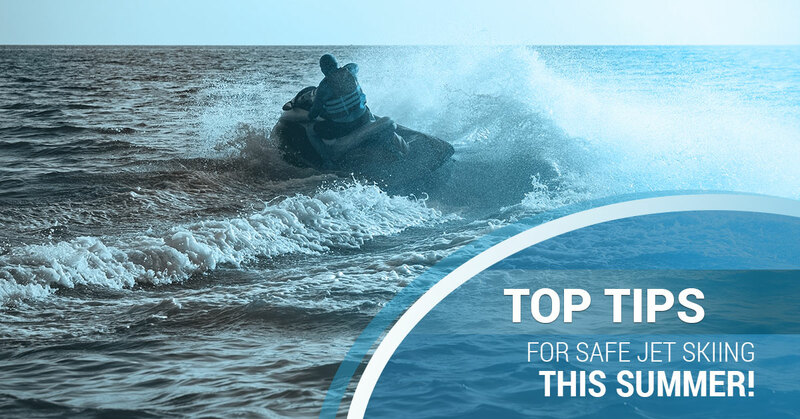 Avoid drinking while operating a personal watercraft – It goes without saying that alcohol is one of the leading causes of watercraft accidents. As with operating a vehicle, drinking while on a jet ski can impair your judgment, reaction time, and coordination. Officials strongly advise to hold off on the drinking until after you’ve finished up on the water. Don’t speed – Along with drinking, speeding is another leading cause of accidents on the water. If you’re a veteran of jet skiing, you know that it’s proper etiquette to give plenty of space to other PWC riders. So slow down and be sure to allow for ample room to stop. The absolute last thing you need is to become responsible for a serious injury to yourself or someone else while enjoying time on the water. Keep your Jet Ski properly maintained – This could be the first summer where you’ve used your jet ski in several years. If that’s the case, it’s a good idea to perform a jet ski maintenance safety checklist prior to taking it out on the water. Pay close attention to cables, as well as fuel and oil levels. Remember to start the engine on land before as a final double-check. Unfortunately, even taking the proper safety precautions won’t always prevent personal watercraft accidents. One way to add an extra layer of safety to your jet ski is with customized boat covers from Marine Customs. In previous blog posts, we’ve stressed the importance of a SeaDek alternative for your boat. But our marine flooring options aren’t just limited to boats. Marine Customs can create effective, non-skid decking solutions while using a SeaDek type material. Let’s see if this sounds familiar. Your jet ski is covered in an old, slick-surfaced material that’s been worn away over the years. As an authorized fabricator and installer for non slip boat floor coverings, we can take on your situation with ease. Since we believe in providing only the best for our customers, you can look forward to EVA foam that’s both comfortable and durable. As a bonus, the foam also provides maximum wet/dry traction – ideal for long days at your favorite spot. Then take advantage of our innovative 3M peel and stick application that’s easily cut to fit. Take your jet ski upgrade to the next level with complete customization options. Our team can add custom patterns, graphics and/or logos to your PWC based on your needs. Get started with Marine Customs today.